IN THIS BRUTAL EXPOSE YOU WILL WITNESS THE BIRTH OF A GLOBAL POLICE STATE THAT SURPASSES ORWELL'S NIGHTMARISH VISION. IT'S ALL HERE: THE HISTORY OF GOVERNMENT-SPONSORED TERRORISM, THE MODERN IMPLEMENTATION OF FEAR-BASED CONTROL AND, MOST FRIGHTENING OF ALL, THE NEW WORLD ORDER'S FUTURE PLANS. THIS IS ONE FILM YOU CANNOT AFFORD TO IGNORE. THE FUTURE OF FREE PEOPLE EVERYWHERE IS AT STAKE. .....NOW THE PAINFUL FACTS ARE IN. THE DARK FORCES OF GLOBAL GOVERNMENT ARE FUNDING, TRAINING AND PROTECTING TERRORIST NETWORKS WORLDWIDE. 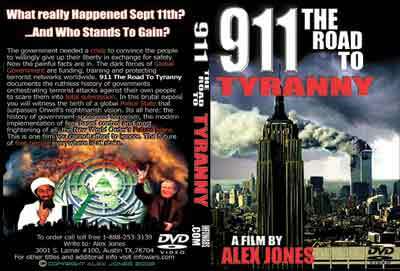 .....911 THE ROAD TO TYRANNY DOCUMENTS THE RUTHLESS HISTORY OF GOVERNMENTS ORCHESTRATING TERRORIST ATTACKS AGAINST THEIR OWN PEOPLE TO SCARE THEM INTO TOTAL SUBMISSION. .....IN THIS BRUTAL EXPOSE YOU WILL WITNESS THE BIRTH OF A GLOBAL POLICE STATE THAT SURPASSES ORWELL'S NIGHTMARE VISION. .....IT'S ALL HERE: THE HISTORY OF GOVERNMENT-SPONSORED TERRORISM, THE MODERN IMPLEMENTATION OF FEAR-BASED CONTROL AND, MOST FRIGHTENING OF ALL, THE NEW WORLD ORDER'S FUTURE PLANS. .....THIS IS ONE FILM YOU CANNOT AFFORD TO IGNORE. THE FUTURE OF FREE PEOPLE EVERYWHERE IS AT STAKE. You can get this DVD for a minimum donation of $26.